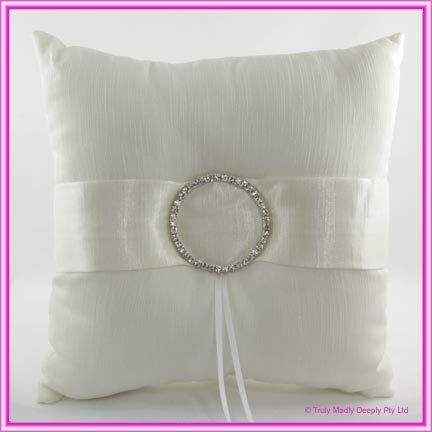 This stunning soft ivory ring pillow/cushion features a beautiful fabric that is similar in look to Thai silk and a beautiful sash that is set with a large brilliant glimmering diamante circlet. The circlet buckle is a quality product with glass diamantes and set in a tarnish resistant metal body. This is a stunning ring pillow. Matching guest book and feather pen are also available in this collection. See below for details.